How’s The Reception on Your Kit Kat? If you take a few minutes to stop by KitKat.com and poke around, you might find yourself chuckling a bit. My favorite page of their redesigned site is the Pioneering page, where we discover the phrase ‘Confectionery Perfectionery’, and notes about wanting the individual wafers to “look like big square mountains.” Yep, it’s a Kit Kat blueprint – er, brownprint? – and it’s hilarious. Another page I recommend spending some time to really take it all in is the User Experience page, where you’ll learn that Kit Kat’s “maximum breakability” can be attributed to “refined praline software, crisp waferware and its unique chocolate unibody.” The ‘Tech Spec’ page is pretty great, too, as is the… well… maybe you should just check them all out! And for a better understanding of what exactly is going on, check out the Android website, Hershey’s website, or this article on Marketing Land. As adorable as the Android mascot is, chances are pretty good that we aren’t going to be branching out into mobile phones at Blair Candy. That said, we do happen to be a great resource for the edible variety of Kit Kats! They don’t need a case, they taste terrific, and they’re a whole lot cheaper than a new phone, too. Sure, you can’t talk on them, but you shouldn’t talk with a mouthful of chocolate anyway! Which version of Kit Kats are your favorite? 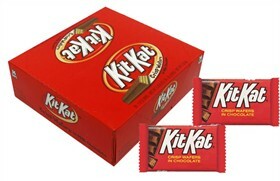 Regular Kit Kat candy bars, King Size Kit Kat Minis, or Snack Size Kit Kats? Halloween Candy and Supplies Are Here! It’s become a fiesta of Fun Size goodies here at Blair Candy, with new Halloween candy treats and supplies arriving every day! The orders are already coming in from Halloween fans across the country – folks who know how quickly the best and newest candies can sell out. We do our best every year to ensure we have enough Halloween candy to carry us through October 31st, but sometimes we can’t predict which will have the most popularity. Sure, Reese’s Peanut Butter Pumpkins are a top pick year after year, and we’re certainly never surprised by how many orders for Skull Lollipops come through! But we do add new treats every season that you’ll want to scoop up fast to ensure your sweet tooth gets satisfied. And with Halloween itself growing in popularity every year, shopping early for all your Halloween candy and supplies might be best! BlairCandy.com offers Halloween candy classics as well as new candy creations. Some people come to our site for the latest in sweets, like these groovy goodies, Tie Dye Lollipops! Others love our nostalgic candy offerings, like Wax Fangs, Necco’s Mary Jane candy, and Slap Stix caramel pops. Others still – most, in fact – love both! Mixing classics from our childhood with newer candies that might become the classics of tomorrow is not only fun, but gives us a good variety in the event that we have some sweet, sweet leftovers to eat up ourselves! 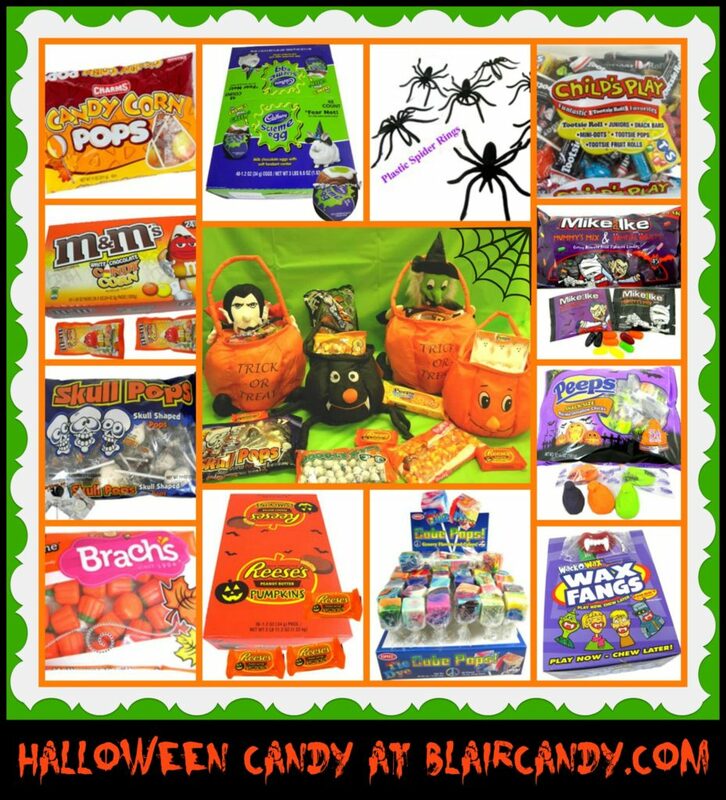 BlairCandy.com puts the greatest focus on the candy side of Halloween, but we’re also excited to offer Halloween party supplies, including colorful balloons, napkins and table covers, plastic spider rings, and adorable soft treat baskets that can be used as decoration or for Trick-or-Treating!